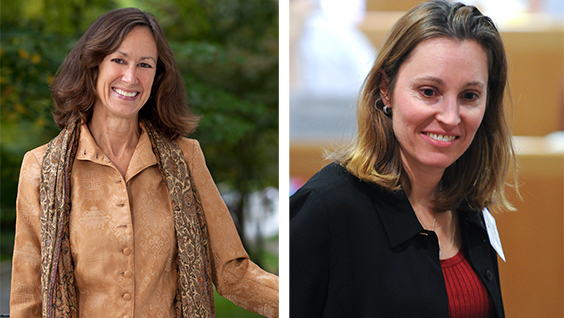 BOSTON—Two Harvard Business School (HBS) faculty members, Professor Kathleen McGinn and Associate Professor Anita Tucker, recently received the sixth annual Wyss Award for Excellence in Mentoring for their work with students in the Doctoral Programs. Nominees were chosen by current doctoral students from the array of faculty with whom they had worked. The list of nominees was then reviewed by a student selection committee comprising doctoral students from a number of fields, including accounting, business economics, marketing, management, organizational behavior, and technology and operations management. “Kathleen is everything I could ask for in an advisor,” said one student about working with McGinn. “She always puts my best interests first. If I have an idea, she will brainstorm with me, dig deep into study design, and provide me with the positive encouragement that I need. She does this whether the project is with her or another advisor, treating each of my studies as if it were her own. She gets excited about the ideas and research and helps me stay passionate about my work." McGinn, who won the senior faculty Wyss Award, is the Cahners-Rabb Professor of Business Administration and chair of the Doctoral Programs. A member of the Negotiation, Organizations and Markets Unit, she studies the role of interpersonal relationships and gender at work and in negotiations, using both laboratory and field methodologies. Tucker, who won the junior faculty Wyss Award, teaches in the Technology and Operations Management Unit and is a Marvin Bower Fellow. Her research focuses on healthcare organizations and issues related to patient safety, efficiency, patient experience, and implementing best practices. She is currently working with healthcare organizations to study the impact of hospitals' internal supply chains on patient outcomes and staff efficiency.